* In Colorado, indirect supervision requires only preapproval, not the presence of a dentist. Sources: 1. 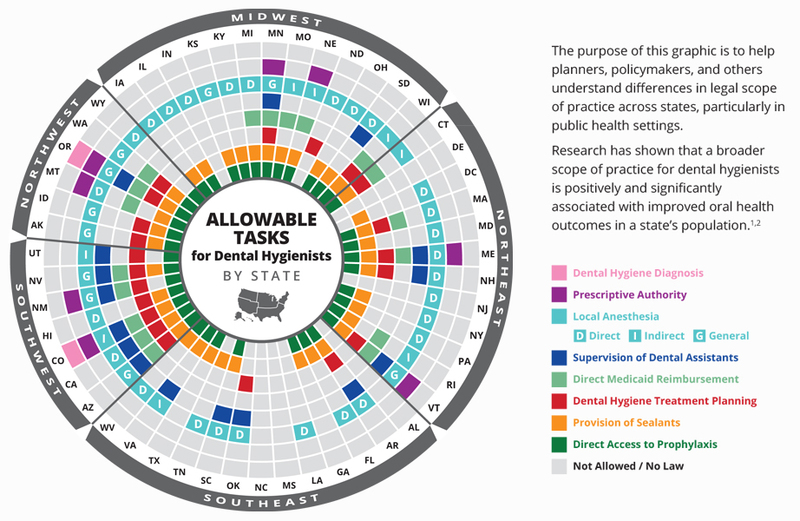 Langelier M, Baker B, Continelli T. Development of a New Dental Hygiene Professional Practice Index by State, 2016. Rensselaer, NY: Oral Health Workforce Research Center, Center for Health Workforce Studies, School of Public Health, SUNY Albany; November 2016. 2. Langelier M, Continelli T, Moore J, Baker B, Surdu S. Expanded Scopes of Practice for Dental Hygienists Associated With Improved Oral Health Outcomes for Adults. Health Affairs. 2016;35(12):2207-2215. This work was supported by the Health Resources and Services Administration (HRSA) of the U.S. Department of Health and Human Services (HHS), under the Health Workforce Research Center Cooperative Agreement Program (U81HP27843). The content and conclusions presented herein are those of the authors and should not be construed as the official position or policy of, nor should any endorsements be inferred by HRSA, HHS or the U.S. Government. 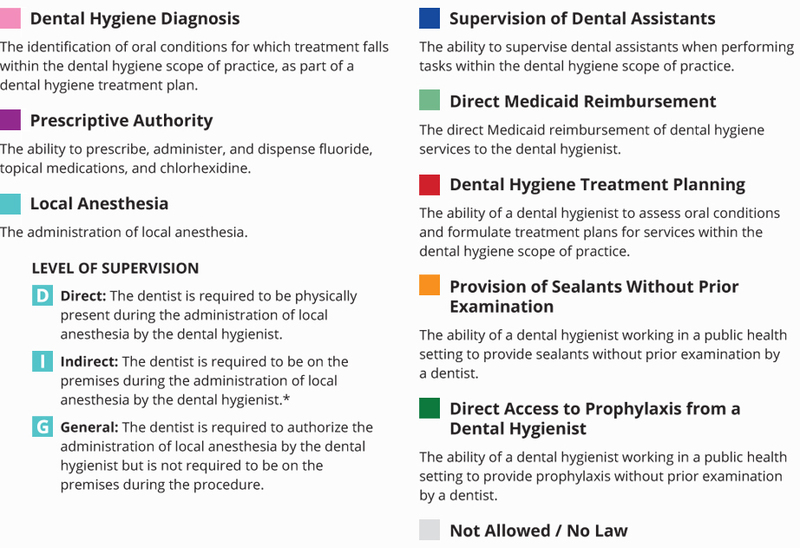 This graphic describes the highest level of practice available to a dental hygienist in a state, including dental hygiene therapy. This graphic is for informational purposes only and scope of practice is subject to change. Contact the applicable dental board or your attorney for specific legal advice.